A Whole9 guest post from Mary Beth LaRue, yoga teacher, life coach, and the co-founder of Rock Your Bliss. The first yoga class I ever attended was in my college town in Iowa. Somehow I happened on something called “classical yoga” where most donned a long white robe and spent the class singing in a language I did not recognize. There were no downward facing dogs for this eager eighteen year old. Needless to say I didn’t find “my yoga” that day. I eventually happened upon a studio in Washington D.C. with a warm, playful teacher who played Bob Marley and encouraged us to move our bodies in a way that “felt good.” All physical activity prior to this was about pushing and striving, so this message was a welcome change. I’ve since tried almost every kind of yoga possible and have found something to embrace in each. And after almost nine years of teaching, I swear by this 5,000+ year old practice that has absolutely changed my life for the better. Here are four ways the practice of yoga, whatever practice you choose, will make you happier. 1. You’ll rediscover the joy of play. Remember when you’d head right outside after breakfast and return home right before dinner with scraped knees and dirty feet? Well, you likely won’t get scraped knees, but in your yoga practice, you will rediscover the joy of play. Embracing a beginner’s mind no matter what stage of the practice you are in — along with a voracious sense of curiosity — will keep you immersed in your practice. There is always something new to learn, and yoga brings a way to approach life with a sense of playfulness. This is true both on and off of your mat. Google the benefits of yoga and you’ll have a five page list of why it will benefit you. But to me, the best part of yoga is how you’ll feel. When was the last time you were barefoot and connecting with your mind and body? (In the sand in Maui with a Mai Tai doesn’t count.) Even on the craziest of days, just knowing that I’ll have 10, 30, or sometimes even 90 (!) minutes on my mat helps me navigate my day with more ease. In a world filled with constant stimuli, my yoga mat is a cellphone and judgment-free zone for as much time as I can spare, and that translates into feeling powerful in the rest of your day. We live in a looney culture. Everything is about speed and productivity and checking off to-do lists. It’s no surprise that our minds our going a million miles a minute. Yoga teaches us that in order to stay present, we stay with our breath. And when we are finally present and not following every single thought down the “rabbit hole,” we will experience more gratitude, more compassion, and more “in the flow” in our daily lives. You may even return more relaxed from your mat then you did from that three day vacation. 4. You’ll be better at everything you do. I promise you this: spend a little more time in your body and a little less in your head and watch your life transform.The presence you’ll bring to your friendships, your marriage, your kids, your workouts, and your job will make you so much more effective and fulfilled. Just give it a try. No matter where you live, there are dozens of options to kickstart your yoga practice. First, check out your local listings for a nearby beginner yoga class. Nothing beats the expertise of a hands-on teacher. Nothing nearby? Try an online yoga studio like Yogis Anonymous (You can even take class with me for 10 days for free using my code ‘marybeth10’ www.yogisanonymous.com) or YogaGlo. There are endless amounts of resources at your fingertips, truly a yoga gold mine for a beginner. 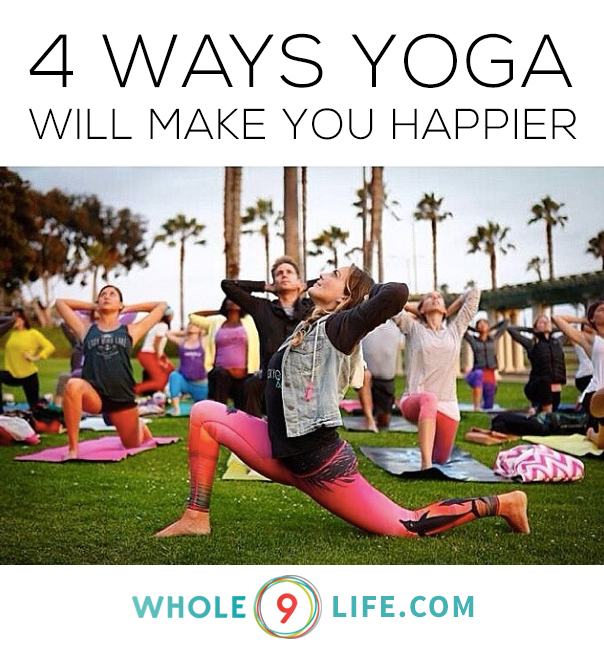 Start your practice, however small or simple, and experience at least four ways that yoga brings you happiness. What have you discovered about your yoga practice? How does it bring happiness into your life? Share your thoughts in comments. 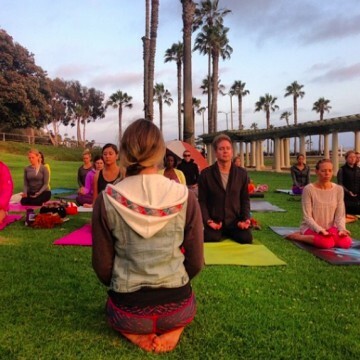 Mary Beth LaRue is a yoga teacher, life coach and the co-founder of Rock Your Bliss. She’s a lover of avocados, homemade chai tea and hip hop. She’s an Iowa girl living blissfully in Venice Beach with her husband and their lovable English bulldog, Rosy. Whether it’s through a sweaty yoga practice, a gratitude meditation, or a conversation over coffee about life goals, Mary Beth’s mission is to lead people toward their bliss.